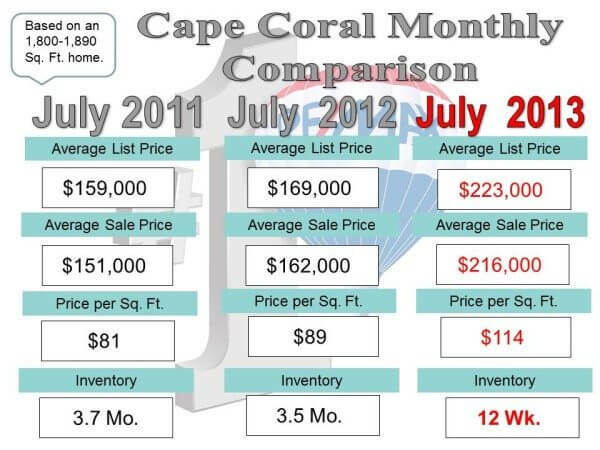 Cape Coral #2 in Top Housing Recovery…. Cape Coral names #2 for Top Housing Recovery…. Cape Coral was once again named as one of the Top Housing Recovery areas in the Country. Not surprising though…. at 3.7 months of inventory and today we are at about 12 weeks. With a new City like Cape Coral (Incorporated in 1970) the Building Industry is the main business focus. That is what Cape Coral has been doing … building, building, building…114 square miles of land to build and a beautiful City emerging. This is the tip of the iceberg I am seeing….no new inventory for five years….prices go up. Click Here to Read more on the Positive Signs of Housing Recovery.